Visits: 21498 persons viewed this recipe. A simple chocolate cake is perfect for a number of occasions. You can have it as an evening snack along with tea or you can prepare it for a birthday or a get together with friends or family. What’s more, you can surprise and delight your loved one by preparing this awesome dessert. It goes well with any occasion. Well, chocolate cake is one of the favorite all time desserts of everyone. From kids to elders, each one loves that amazing taste of this lip smacking dessert. The unsweetened cocoa powder provides the rich chocolate flavor and the best part is that it is non-fatty. Good news is that it is easy to make. 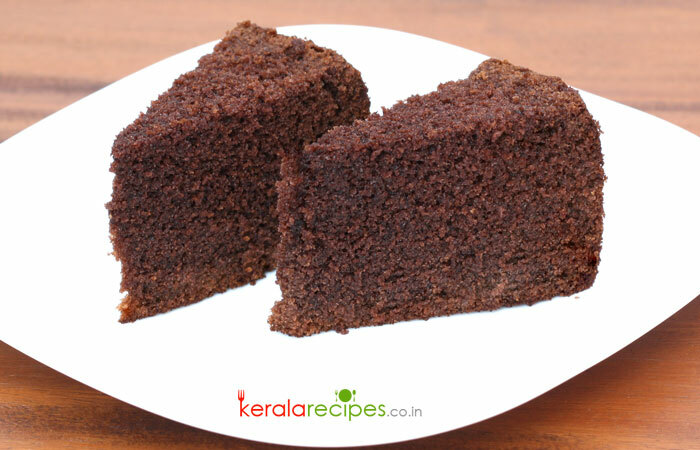 There are many versions and flavors of a chocolate cake; however, this cake recipe can be prepared within minutes at home and one doesn’t need to be really skilled to prepare one. With less effort, you can make the entire family treat their taste buds with awesomeness. Make sure that all the ingredients are in room temperature. Pre-heat the oven at 180 Degree Celsius (350 Degree Fahrenheit) for about 10 minutes. In a mixing bowl, whisk together the all-purpose flour, baking soda, cocoa powder, and salt; keep aside. Combine together milk and coffee powder; set aside. Add powdered sugar and continue beating for another minute. To this mixture, pour vegetable oil and beat for yet another minute. Now pour the milk and coffee mixture and continue beating for 30 seconds in low speed. Pour the chocolate cake batter to the greased baking pan. Tap the pan on a counter top to release any air bubbles in the cake batter. Remove from the oven and let the cake sit in the pan for 10 minutes. Run a long knife around the edge of the baking pan. Then, twirl the cake out on the racks so that it cools completely. In order to preserve moisture and to prevent the cake from becoming dry, make sure you store it in a clean dry air tight container. If you wish to, garnish the chocolate cake with your favorite frosting. Tried the vada and the chocolate cake as I had a party at home. It came out soo well. Thanks for the easy recipe. Hi Shaan, What are the main contents of all-purpose flour? Can we use “maida”? Or is it maida itself ? Hi Shaan, How are you? Came over to your blog after seeing your post on Indiblogger. We are a married couple from Mumbai, very new to blogging. Read this post of yours on simple chocolate cake. I love chocolate cake, but my wife is not such a fan of chocolate. Great blog. Trust you will find some time to visit our blog and leave a comment on our new post. Best wishes and regards, Vee N Ric. Vee N Ric, Thank you very much for your good words of encouragement. Glad to know that you are also into blogging. Please mail me your blog URL (link). Hi Shaan, I made the cake… since I m not a chocolate cake lover, I omitted choclate powder and coffee powder. And it came out sooo yummy moist soft yellow cake and its very easy to make. Thanx Shaan expecting more such easy recipes. Appu, Glad to know that you done the cake well. I will try to add more easy recipes. Thank you very much for the feedback.